YOUR MAMAS NOTES: Sitcom star turned hospital drama denizen Kate Walsh (Private Practice, Grey's Anatomy, The Drew Carey Show) must really want to sell her 1928 Spanish mansion in the Los Feliz area of Los Angeles, CA because she's just put it back on the open market with an asking price of $3,995,000, just over three-quarters of a million bucks less than she paid for the celebrity-style casa in June 2007. 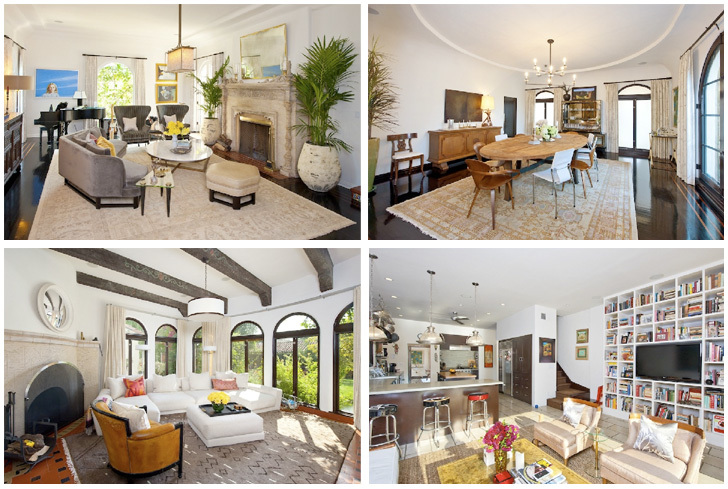 Miz Walsh plunked down $4,750,000 for the 5,940 square foot house just a few short months before she officially hitched her romance wagon to entertainment industry executive Alex Young. By December the following year the 15 month marriage had done swirled down the unforgiving Tinseltown Terlit of Love. The ginger haired actress–who recently roasted Charlie Sheen–first pushed the property on the open market in May 2010 with an asking price of $4,295,000. Five months later the property was de-listed. Since then Miz Walsh has done some redecorating–particularly in the formal dining room where she replaced a hulking square table with an oval one that matches the shape of the plaster ceiling detail–and this week she slid the sophisticated crib property back on the market with an asking price of $3,995,000. The double-gated mansion maintains many of its original architectural details and features a double-height foyer ringed by a second floor gallery that's sure to impress guests and the hunky UPS delivery man. The main rooms include a step-down formal living room with fireplace, over-sized dining room, family room/den with beamed ceiling and rows of arched windows, and an eat-in center-island kitchen that's open to another sitting room with glass panels that disappear into the walls and open the room like a porch to the entertaining terrace with built-in barbecue center. Listing information shows a total of 4 bedrooms and 4.5 bathrooms in the main house. The ballroom-sized master suite as gleaming wood floors, lots of windows, a fireplace, sitting area and high-glam sky-lit bathroom with freestanding soaking tub, double sinks and mirrored vanity table. Miz Walsh converted one of the four bedrooms, as per listing information, into a celebrity-style walk-in closet/dressing room lined with shoe racks and glass-doored accessory cabinets. A single-story 3-room detached structure with arched colonnade and updated bathroom expands the living space and is currently configured as two offices plus a sky-lit fitness studio with vaulted ceiling, mirrored walls, and full complement of matching Pilates equipment, much of which bears a striking resemblance to the sort of contraptions one might find in a fetish club. Several terraces and covered patios encourage outdoor living and the backyard comes complete with grass patch for the pooches, in-ground swimming pool, spa, and a large terrace with pergola-shaded dining area and outdoor fireplace. We really have no idea where Miz Walsh wants to move but wherever it may be she's willing to take a giant hit to her designer pocketbook to get there. Best of luck, darlin'. Could it be that she doesn't necessarily want to sell, but rather needs to sell in order to satisfy a property settlement with her ex or some such thing? Cutting all ties may be worth the money. . .
Is this the house that was profiled in Oprah's deceased home magazine? Miss Kate was the first cover not to feature Miss Winfrey. I liked that house -- especially the fact that she'd had the painters cover all the trim with glossy piano black. Finally a soaking tub beside a window you can actually look out of without standing up. Amazing. Nope, this house was InStyle right before it went on the market the first time. O at Home was a different house. I'm sure I'm hopelessly pedantic, but what would be the purpose of not one but TWO farmhouse sinks in a bathroom? Is this an erstwhile cattle ranch? If only I could find that sort of money in between my couch cushions! Just the thought of living is enough to make me a wee bit moist. Apparently all the other gutter-minded chil'ren are currently occupied and I've been the one designated to beg the question - "Ahem... uhhh... Mamma, just how is it that you know what a person might find in a 'fetish room'"? It's really none of my bid'ness of course, but inquiring mind want to know. Plus I've always been a believer that knowledge is power. It's a lovely casa, but just one lot in from busy, busy Los Feliz Blvd. Of course, the Lloyd Wright "Shark House" sold for $3,850,000 on 7/11/11 (perhaps it was the lucky sounding date?) on busy Franklin Ave. in the same hood, so perhaps Ms. Walsh will have lady luck on her side this time around. Plus, the Biggest Loser Dr. has his crib on the market around the corner for a an absurd $5.9 million and it's right on the Blvd., making Ms. Walsh's crib shine even brighter. As for the decor, I'm loving all of her sofas. Is there a term for the angled ones? I'm over the flower pattern bathroom tiles, but I fear it's a trend that's only just begun. Is it me or is the kitchen kinda blah? i live right around the corner. This house was beautifully redone prior to her buying it...and she def. bought at the top of the market. I know her divorce was so acrimonious with her husband that part of the settlement was that they each had a turn picking one item from the house to keep..they were married less than 2 years..and she obvs paid for everything. I know she's had some problems with her neighbors. the front wall is not high..maybe 4 feet..so you can clearly see the house and in the windows. Paparazzi in the morning just stand with their cameras leaning on the wall and take pictures..I believe she wanted to raise the wall to 6 feet and her neighbors fought her with the city. Some lucky person will get a real metziah here. I, too, think this is a really lovely home. I bet she doesn't have much trouble selling it either. Probably the lack of privacy is why Ms. Walsh is selling it. Whatever it cost to get rid of her ex, I bet she thinks it was worth it. Still want to hear more about Maria Shriver's new home, Mama. This house has posed big privacy problems that Miss Walsh PARTIALLY addressed with those giant hedges in the front and sides. That (together with the legacy of nasty relations between neighbors and the seller-renovator) led to a series of legal confrontations and city rulings ordering the removal or reduction of the hedges. At last hearing, Miss Walsh was appealing those rulings, and I don't know how that went. But I do know that her first decision to sell came right after one of the worst rulings. I can't imagine other celebs wanting to but it if there is a privacy issue; she'll probably have to lower her price even more. Madam Pince - Not the same house. I remember when she sold that one and bought this, I was heartbroken I couldn't afford the first one she was selling. It was spectacular. I think it's the only issue of O I ever bought, just to cut out the pictures of that home. p.s. This place is lovely. Kate has great taste in architecture. I used to love LUV Los Feliz but a recent journey through it lead me to downgrade my feelings ever so slightly. The approach through Franklin, Western and the eastern side is congested and dare I say, run down to 1990s standards. Also, there is only one decent grocery store. True, the restaurants are fine, but nowhere near the caliber you find on the west side. It's a 45 minute drive to BH for hair, and let's not pretend there is anywhere in LA besides BH to get your hair did, girlfriends. There's not. It's truly lovely there, don't get me wrong. Just wouldn't want to have to leave and return every day through the traffic and have to order Thai all the time. Those bathroom sinks are ’vessels’, not ‘farmhouse’ and considering the tub selected, they go beautifully. And the name of that angled sofa is: U-G-L-Y. I like the house though. It's a beautiful house but all of the walls are white...that is what was bothering me.